URBANA, Ill. — Two University of Illinois scientists, along with research and extension collaborators across 13 states, have received a national honor for improving water quality in relation to agricultural drainage. The 2018 National Excellence in Multistate Research Award from the U.S. Department of Agriculture National Institute of Food and Agriculture was presented to the group officially known as the North Central Extension Research Activities (NCERA) 217 Committee on Drainage Design and Management Practices to Improve Water Quality. 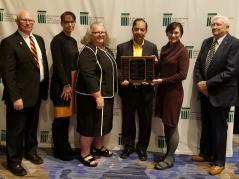 The award was presented Nov. 11 at the annual meeting of the Association of Public Land Grant Universities (APLU) in New Orleans. Representing Illinois on the NCERA-217 team are Laura Christianson, assistant professor in the Department of Crop Sciences, who chaired the committee in 2017-2018, and Richard Cooke, professor in the Department of Agricultural and Biological Engineering at U of I. The goal of the multistate committee’s research is improved drainage management to maintain crop productivity while significantly reducing water quality problems. The team has helped develop federal USDA Natural Resources Conservation Service standards for several conservation practices, including denitrifying bioreactors. These are wood chip-filled trenches installed at the edge of an agricultural field. As drainage water flows through the trench, bacteria housed in and fueled by the wood chips clean nitrate from the water. Cooke was the first to trial the technology in the U.S. in the late 1990’s, and over the past decade, joint efforts by Cooke and Christianson have led to important advances in the design and operation of this practice. The team has won two awards for multistate extension publications. One of these, “Ten Ways to Reduce Nitrogen Loads from Drained Cropland in the Midwest,” was co-authored by Christianson and received a national American Society of Agricultural and Biological Engineers Blue Ribbon award in 2017. The group meets annually and has organized educational symposia and field days. Related collaborative efforts include the Transforming Drainage Project, aimed at assessing and developing new water storage practices and technologies for drained agricultural landscapes. The National Excellence in Multistate Research award comes with a $15,000 grant for committee activities. The committee also received the North Central Region’s Experiment Station Section Award for Excellence in Multistate Research in 2018. The NCERA-217 committee is supported in part through USDA National Institute of Food and Agriculture by the Multistate Research Fund, established in 1998 by the Agricultural Research, Extension, and Education Reform Act (an amendment to the Hatch Act of 1888) to encourage and enhance multistate, multidisciplinary agricultural research on critical issues. Additional funds are provided by contracts and grants to participating scientists.